The last week has been busy with all sorts of things so I’ll try to catch up with posts about the things I have been doing in the following days. First up is the finished apron! I finally got around to take a picture of it and I’m really pleased to show it to you. It turned out wonderful and it will be put to the test in the kitchens at Civil War in October. 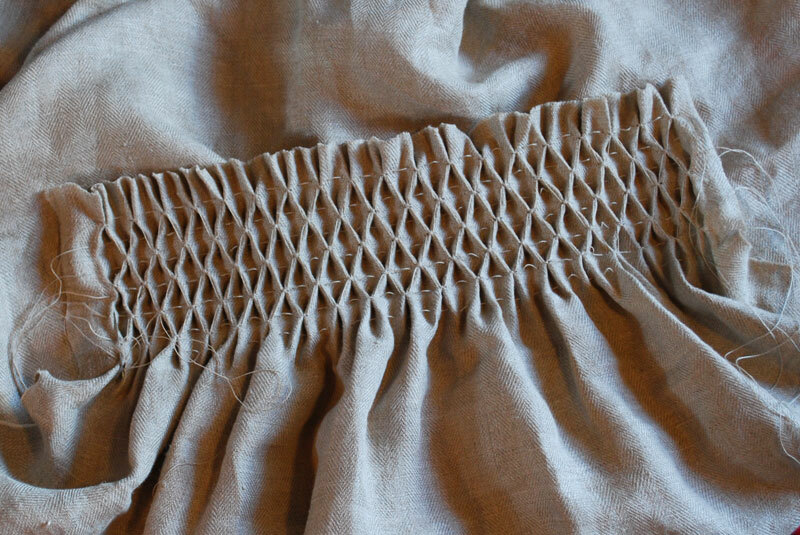 After doing some sample smocking, with good results, I set out to do another gathered apron. I had previously bought some lovely linen in a herringbone twill and was happy to finally use it. The sample smocking told me I needed to use twice the desired width of fabric so I cut out an 80 cm wide apron with a length of 90 cm give or take. Almost done with the honeycomb pattern. I made the gathering stitches 1 cm apart and several enough so that the gathering was about 7 cm wide. Then I started on the honeycomb stitch and this time I didn’t leave any empty rows (like I did in the sample), I think it made a prettier and more even impression in the end. My honeycomb stitches were 2 cm apart. I managed 5 rows of stitches which I think is wide enough. You can see the lovely herringbone twill in the bottom right corner of the picture. After that all that was left to do was to finish the edges and then attach the ribbon at the waist. I used the full width of the fabric for the ribbon and made it 2 cm wide. The honeycomb pattern with the gathering thread still left in the fabric. After making the first gathered apron that turned out a bit to narrow I realised that I needed to make some comparative smocking to see how much fabric that was needed for the desired width. I cut out four pieces of fabric all 30 cm wide. On three of the pieces I made gathering stitches 1 cm apart and on the last one I made the gathering stitches 1,5 cm apart. Then I made a simple honeycomb pattern on all four pieces with a 1 cm, 1,5 cm and 2 cm distance between the rows on the pieces with the narrower gathering stitches. On the piece with the gathering stitches 1,5 cm apart I made the rows 1,5 cm apart. The bottom two became to narrow and the one on the bottom right had got a to deep pattern because of the gathering stitches being 1,5 cm apart. I like the two on the top and the one on the left is the one I’m using. After smocking it measure about 17 cm wide which means that I have to use twice the desired width of fabric. The other ones need at least three times the desired width of fabric which will make the bottom part of the apron to large. This little comparative studie was really quick to make and I really recommend anyone to do it, if not just to practice smocking and ge a feeling of the final result. After the smocking was finished I folded the side and the bottom of the apron twice to fell the edges with a simple hemming stitch. I make my hemming stitch so small on the right side of the fabric that it looks like a prick stitch. It’s a lot faster this way than making actual prick stitches and makes a very neat impression. At the top of the apron I took a long piece of linen with a 5 cm width. I folded long edges and then folded it again to make a long double folded waistband. The waistband was sewed as close to the top honeycomb stitches as possible. Washing, ironing and… Tada, one gathered apron with smocking! My hips are to big for this apron, I probably need a smock with a width of 35 cm. But Rose was gracious enough to put on a dress at our latest Juneborg sewing circle so that I could take some pictures. Thank you! For the smocking I’m using what Wikipedia calls the surface honeycomb stitch. An excellent step by step guide can be seen here. First try at the surface honeycomb stitch. My first thought was to do the stitches with 1 cm between the rows. I then sewed a total of ten rows. That made the height of the smocking approximately 9 cm. Then I loosened the threads from the gathering stitches to look at the result. On the second try I made rows with 1.5 cm between (or slightly wider). 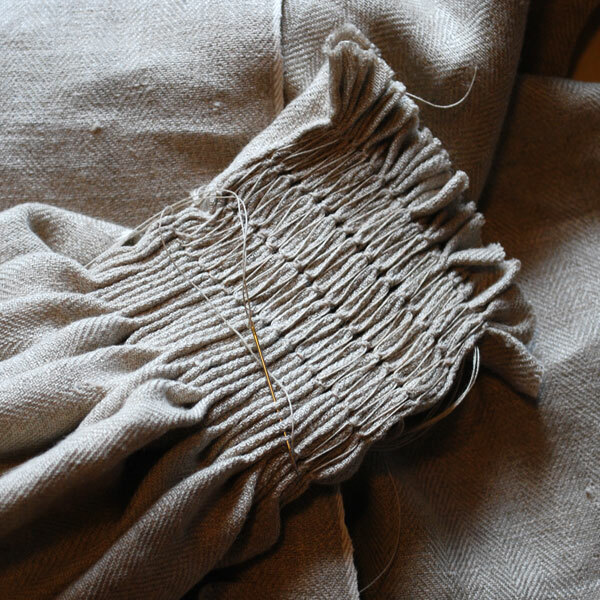 This made 6 rows and when I pulled out the threads from the gathering stitches the apron was 25 cm wide at the smocking. A much better result! So, having reached the conclusion that a smock is needed to make a gathered apron I decided it was time for me to try the technique. A while back Dis showed me the basics of smocking and it wasn’t all that complicated. I bought some linen at IKEA couple of months ago when I run out of it and decided to use that. It has a sturdy weight that I thought would work perfectly with aprons. I used half the width, about 70 cm, and the length of the apron is 90cm. The apron with gathering stitches. I sewed gathering stitches along the upper side of the apron. These stitches will help gather the fabric in even folds that I then can sew together with the smocking stitch. It’s approximately 1 cm between the stitches and the same between the rows of stitches. The later isn’t that important and I could probably have sewed the rows further apart. The distance between the stitches will determine the depth of the folds. The fabric pulled together using the gathering stitch. Tie a knot on one side of the apron and then pull on the threads to create the folds. I secured my thread with two separate bow-ties to make sure the tension was even. I’ve left 2 cm of fabrics at the top of the apron so that I have something to sew the waist tie on. The apron is now ready for the smocking stitches. There are plenty of period examples of the gathered apron. I especially like the women in the Luttrell Psalter, like this one. The Lutrell Psalter can be viewed on British Library Image Online, a great resource! The Tacuinum Sanitatis also shows several examples. One of my favorite examples is this one, it’s a diptych by Mayer Van den Bergh. The sources shows that this was a design used over a long period. The gathering can be made in several different techniques. A really simple technique would be to sew long stitches and then bunch up the fabric by pulling the thread. This leaves a some what messy look and I think that if you take the time to sew an apron it wouldn’t take that much longer to make a more structured gathering. And it makes for a nicer result. Josefin shows the technique here. Another way to make a gathering is some form of pleating. There are a number of different pleats to use. It could be something like the box pleat or perhaps a knife pleat. I haven’t found many sources that point to these types of pleats being used during the period when we have gathered aprons. They are mentioned by Janet Arnold but not in the use of aprons. Looking at sources I don’t think that they give the right look, compared to Tacuinum Sanitatis for example. These aprons where used mainly by the working class. Is it really likely that women who spent the whole day in hard work took the time to neatly press their aprons after each wash? 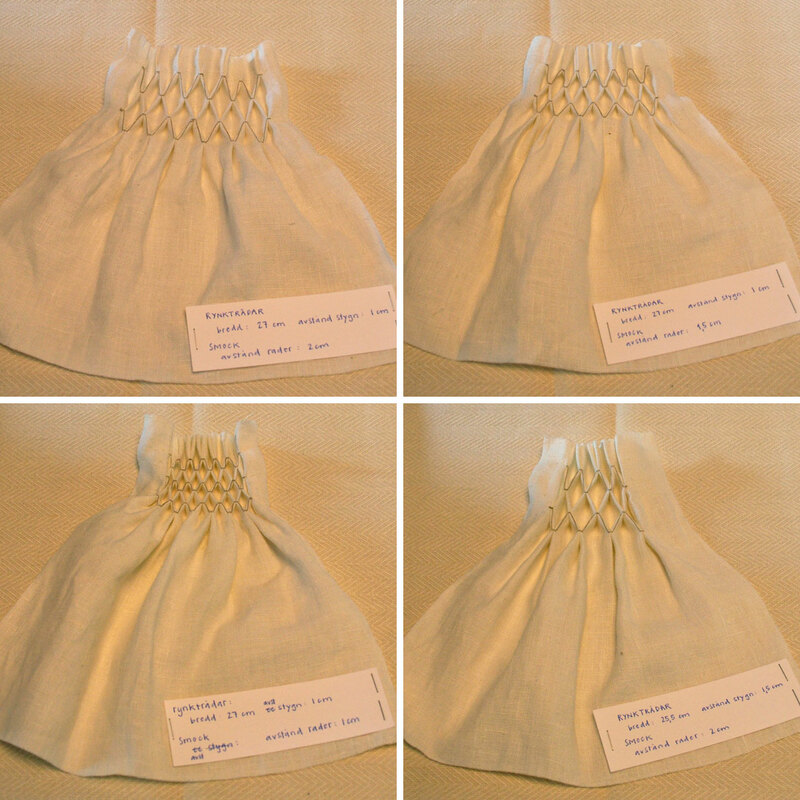 Another way to do the pleating is smocking. It’s a structured way to do the gathering by doesn’t need any special attention after the washing except the usual ironing of some sort. The smock is an embroidery technique were the pleats are sewn together with small stitches. This technique is used extensively used in the later part of the middle ages and can be seen in several painting in the 16th century. Many people seems to think that this is the technique used on the aprons in the Luttrell Psalter where a black thread would be used to make the pattern. It’s my firm believe that to achieve the look we see in our sources of the gathered aprons you need to use some sort of smocking. It could be a simple honeycomb pattern in white or a more decorative pattern in black as those we see in the Luttrell Psalter. I’ve been thinking a lot about aprons lately. It’s seems like that’s an area that we just take for granted, nobody seems to be making any research, at least not publicly. Karen Larsdotter has an excellent collection of links to pictures of people wearing aprons. So after looking through her pictures as well as all my resources in my bookcase I think I’ve narrowed it down to three primary types of aprons. I call these main types the gathered apron, the smooth apron and the tucked in apron (as seen in the pictures). There are other types as well but they seems to be connected to a specific occupation such as a midwife or a smith. 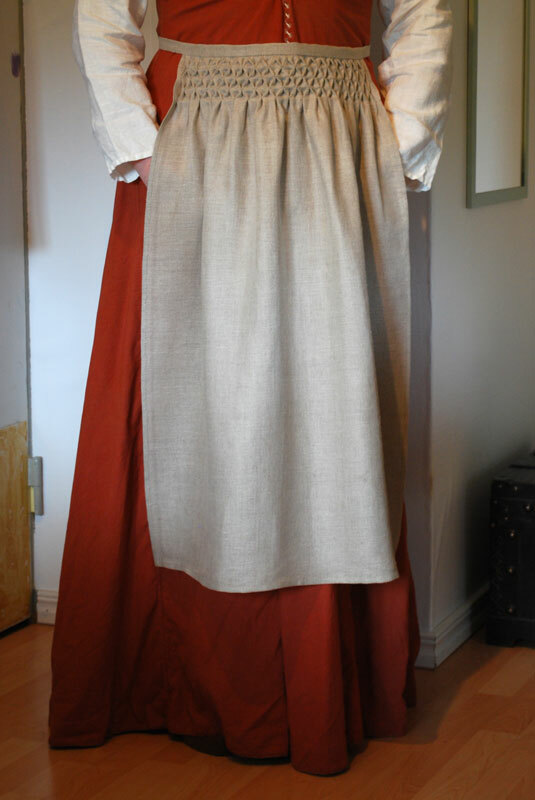 Another popular type in SCA and reenactment is the triangular apron. I’ve read several people taking about sources for this type of apron, often mentioning paintings in Swedish medieval churches (possibly on Gotland) but I’ve never seen any pictorial evidence. If you’ve seen it, please let me know. There is one source for this type of apron in the calender “Ur medeltida kvinnoliv” it’s from Roman de la Rose. Funny enough Elina mentioned this a couple of days on her blog and she included the picture. I agree with her that it’s difficult to see this as a reliable source because of it’s (possibly) allegorical meaning. Never the less it seems like people like this type of apron as it covers a lot of your dress. I sewed one like this a couple of years ago and appropriate or not it works like a charm.